Topics in Tweetbot 4.3 use chained replies as the backbone for a cleaner presentation of multiple tweets about a subject. They're easier to create than normal tweetstorms and they are ideal for live tweeting as well as thoughts spanning multiple tweets. You can include hashtags with every tweet when a topic is assigned, and you can also automatically save a group of tweets as a Twitter Collection, which you can later share and publish elsewhere. Topics can be activated in two ways. When you hit the Reply button on a tweet of yours, you're shown a menu to send a reply or create a new topic. The 'Create Topic' screen requires you to add a title (which only you can see) and it has two optional fields for hashtags and Collections. If you choose to mirror tweets from a topic into a collection, you can enter a description for the collection, too. Alternatively, you can create and assign topics by tapping the gear icon in the Compose screen of a new tweet (where Drafts are also located). Once you have some topics (they are stored on a per-account basis), you can pick one and it'll be assigned to the tweet you're composing. Tweetbot nicely indicates you're tweeting in topic mode with a blue bar on top of the compose screen. If you tap the 'x' button, you'll remove the topic from the tweet and your message won't be chained to anything you've previously tweeted. Here's how Tapbots turned a hacky workaround into an elegant option: you don't have to actually reply to yourself, remove your username, or chain tweets every time. 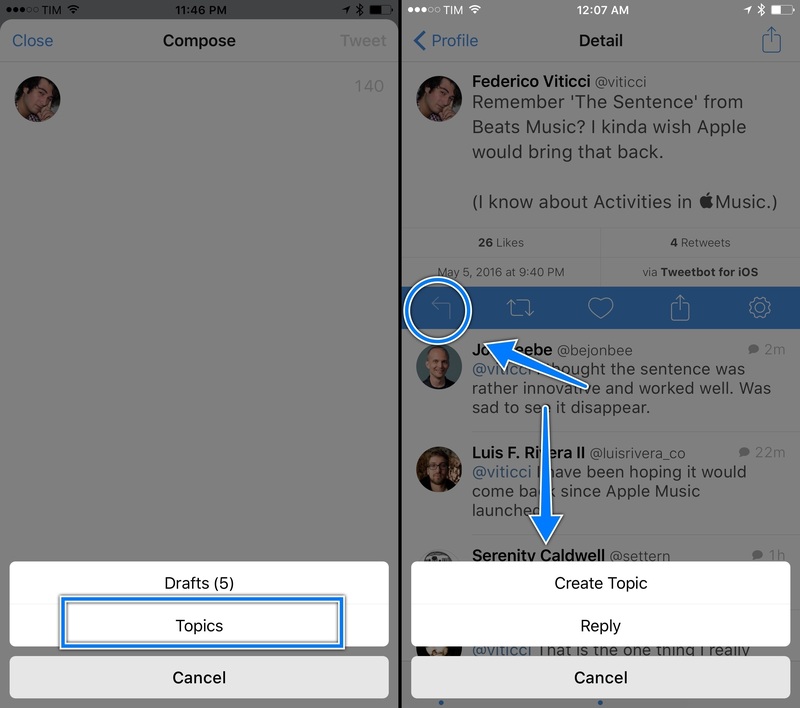 You can just tweet by opening the compose screen and assigning a topic. Under the hood, Tweetbot will find existing tweets belonging to a topic, it'll fetch the latest tweet from that group, and it'll send the new tweet as a reply to it. It even takes care of automatically stripping your username at the beginning of the tweet. Everything happens behind the scenes. You don't have to manage any of it, and you'll end up with a series of threaded tweets that's really a string of messages in reply to each other. It's much simpler and faster than creating a tweetstorm by replying to yourself. It feels like a native Twitter feature. It gets better if you decide to publish a topic as a collection. Until today, Tweetbot had no way to display Twitter Collections, let alone create new ones. 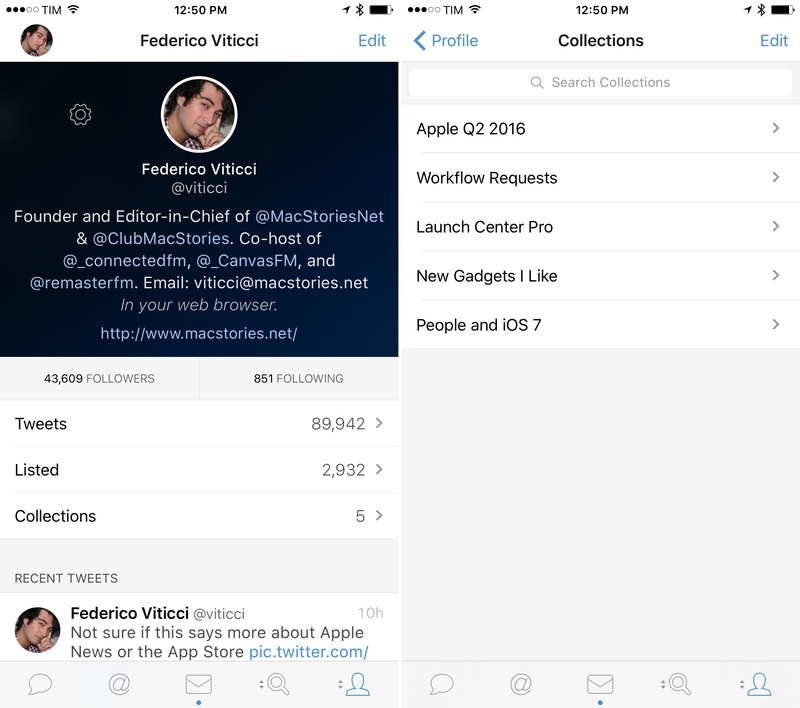 Twitter itself doesn't support adding tweets to collections on its iOS app – you'll have to use Tweetdeck. 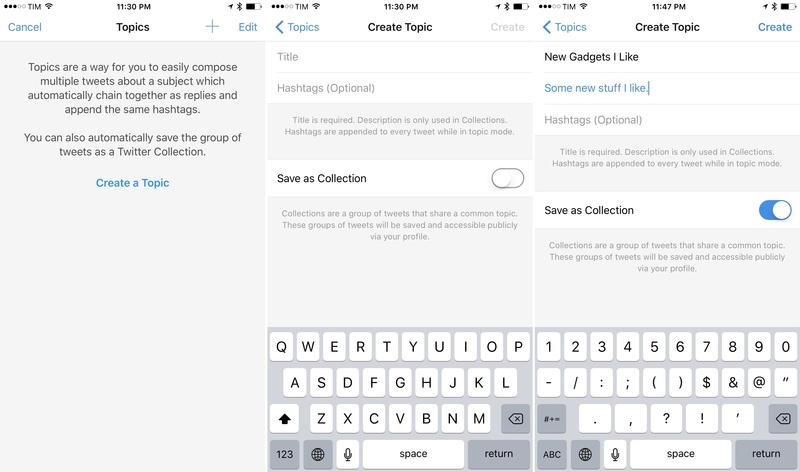 With Tweetbot 4.3, Tapbots added support for the Collection API to add tweets from a topic into a collection. Ironically, Tweetbot has a better chance at making collections more widely used than Twitter's own iOS apps. When you mirror a topic to a collection, every tweet will be neatly grouped in it; you can find collections under your profile. Tweets inside collections are sorted from oldest to newest. You can share a link to a collection or email every tweet from a collection to someone else. If you head over to Twitter.com on a desktop web browser, you can also generate embed codes for collections so you can publish them on the web. Take a look at the topic I created last night with Tweetbot 4.3 about gadgets I like, saved as a collection. The downside of automatic addition to collections is that you won't be able to turn it off for individual tweets. Either you add every tweet from a topic to a collection or you don't add them at all. This is something I'd like to see Tapbots improve in the future. Because topics are stored in iCloud, you'll be able to create a topic on your iPhone, then pick up the iPad and Tweetbot will reply to the latest tweet from a synced topic. This worked well in my tests, though Tweetbot for Mac still hasn't received support for topics and I wasn't able to test the feature on my MacBook Air. 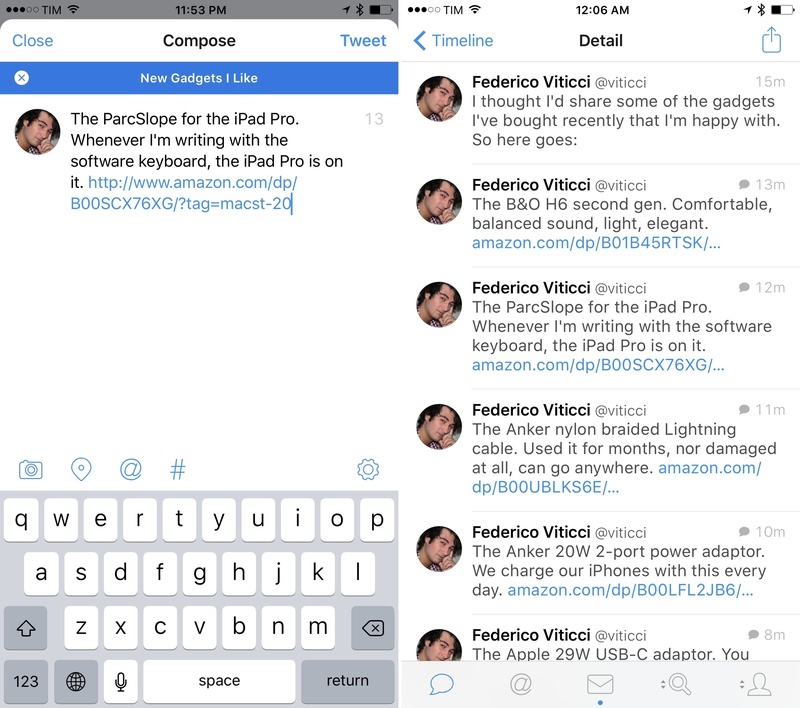 Tapbots says topic support in Tweetbot for Mac is coming soon. Tweetbot's new topic feature is a good example of why we need third-party Twitter clients. Despite the rising popularity of tweetstorms and the idea of posting multiple tweets as part of a longer event or discussion, Twitter has refused to build official support for topics. As a result, users have come up with their own workaround, which isn't ideal but gets the job done. The folks at Tapbots have disassembled the workaround, made it work seamlessly behind the scenes, and they've repackaged it with a nice interface, sync between devices, compatibility with Twitter's apps, and the delightful touch of Twitter Collections. Once again, Tapbots has devised a solution to make Twitter power users save time and have a superior experience than the official Twitter app. I expect to use Tweetbot's topics profusely going forward. Tweetbot 4.3 comes with two nice improvements on the iPad. First, support for hardware keyboards has been expanded and you can now navigate tweets in the timeline with the arrow keys. This, plus the ability to interact with selected tweets through shortcuts, makes the external keyboard experience in Tweetbot fairly solid. Second, Tweetbot 4.3 adds a button to hide and show the secondary column whenever you want. Users who prefer to hide the column will be able to do so with the new button in the top toolbar, but, more importantly for me, this means I can view the column while Tweetbot is in Split View as well. This alone has changed how I use Tweetbot on my iPad Pro. Every day, I take a few minutes to go through my mentions and reply to as many as I can. When I'm doing that, I like to keep an eye on my main timeline as well – which was already possible in Tweetbot 4.0. However, until today, Tweetbot wouldn't show the second column in Split View even though there was clearly enough space for it. With Tweetbot 4.3, I can scroll my mentions, check on my timeline, and use another app at the same time. It's like I'm doing three things at once, and I can't help but wonder about a future version of iOS where you can look at three or four apps simultaneously. I don't think it'd be too crazy at this point. 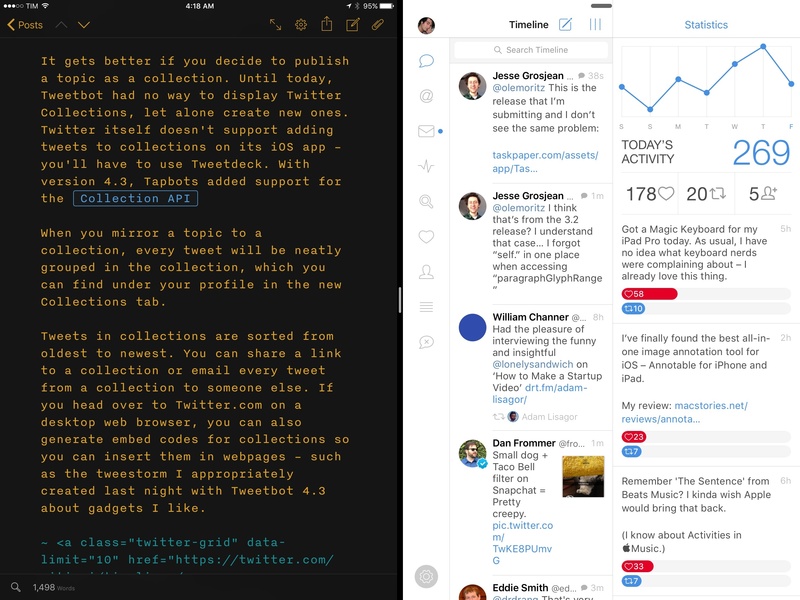 Seven months later, Tweetbot 4 continues to be everything Twitter for iOS isn't: a powerful iOS app with an iPad version that truly takes advantage of the bigger display. You could argue that Twitter's iOS team doesn't care about the power user features that Tapbots builds because they're catering to a different audience. But there's a bigger problem going on. Twitter is simply making a bad iPad app, with a poor timeline design, lackluster system integrations, and a ridiculous iPad Pro UI. Twitter for iPad should be a case study on how you shouldn't design an iPad app – they're shipping the stuff Tim Cook once ridiculed. Twitter used to be at the forefront of iPad interface design. It's sad to see where they've ended up. Tweetbot 4 is the best client for Twitter power users on iOS but it's also the best Twitter app on the iPad, period. 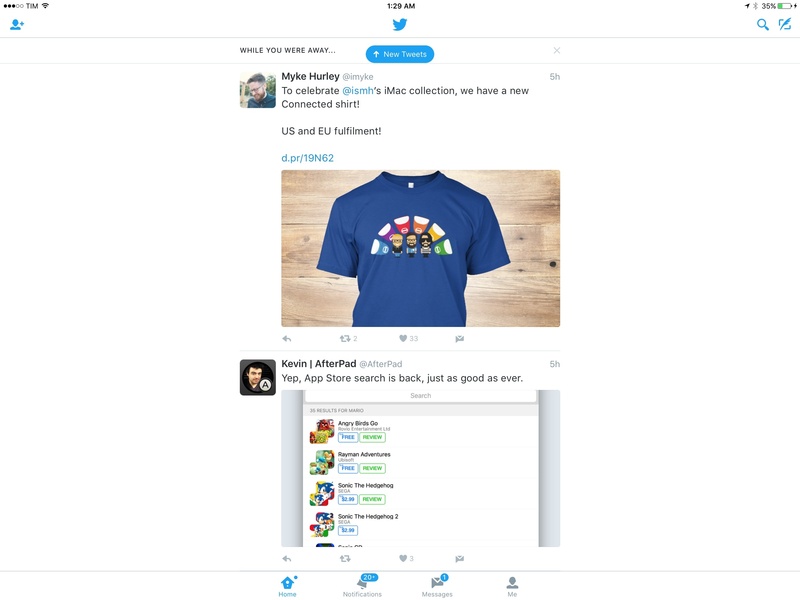 Today's update epitomizes what Tapbots excels at: it offers an intelligent solution for a feature Twitter has avoided to build, and it takes the iPad app to the next level for multitasking with Split View and external keyboard improvements. I expect to see a lot of topic-based tweets in my timeline next month. Tweetbot 4.3 is available on the App Store.